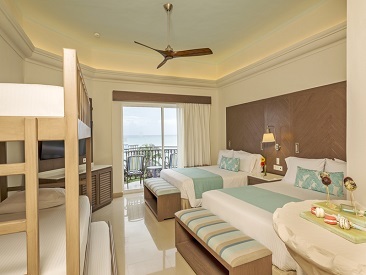 Panama Jack Resorts Playa del Carmen is an all-inclusive, picturesque resort, located on a protected stretch of beach right in the heart of Playa del Carmen. This active resort offers a wide array of activities for guests of all ages, including a supervised children's program, two freeform swimming pools, a host of day and nighttime activities, full-service spa and fitness center, tennis courts and plenty of great dining options; perfect for those seeking a socially active, tropical vacation experience for the whole family. 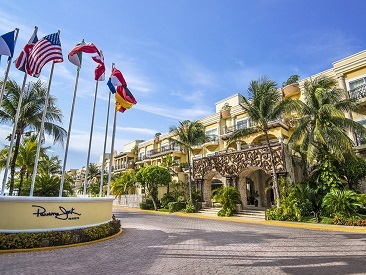 The picturesque Panama Jack Resorts Playa del Carmen is located on a protected stretch of beach right in the heart of Playa del Carmen, the trendy fishing village on the Riviera Maya. The all-inclusive resort offers a wide array of activities for guests of all ages, including a supervised children's program. 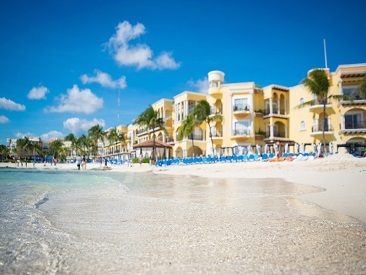 Two free-form swimming pools, a host of day and nighttime activities, a full-service spa and fitness center, tennis courts and plenty of great dining options make this a perfect choice for those looking for a socially active all-inclusive vacation experience for the whole family. Panama Jack Resorts Playa del Carmen's location is a huge plus...right in the center of Playa del Carmen near famous Fifth Avenue, a pedestrian walkway with shops, cafes, and bars at every turn. You have easy access to nearby archaeological sites and ecological parks along the Mayan coast and you're within walking distance to the ferry to Cozumel Island. The state-of-the-art health and fitness center features a spa offering treatments such as massage, seaweed wraps, paraffin treatments, hot-stone therapy and detoxifying facials. Plus you'll find a sauna and steam room, a well-equipped fitness center and a beauty salon. Parents and children alike will love the fully supervised 'Camp Jack'. A staff of qualified professionals will take care of the kids for the day. Children 4 - 12 years old will enjoy a daily schedule of fun and entertaining games and activities as well as a special playground. Hours are 9 am to 6 pm. Lunch is included. Plus family-friendly Master Suite accommodations are available allowing up to 3 children in the same room with two adults. All-inclusive guests have private use of the exclusive 24-hour self-service all-inclusive club lounge with unlimited snacks and drinks whenever you want them! Please note: Due to environmental factors and natural erosion, beach size is susceptible to constant change and may vary seasonally.